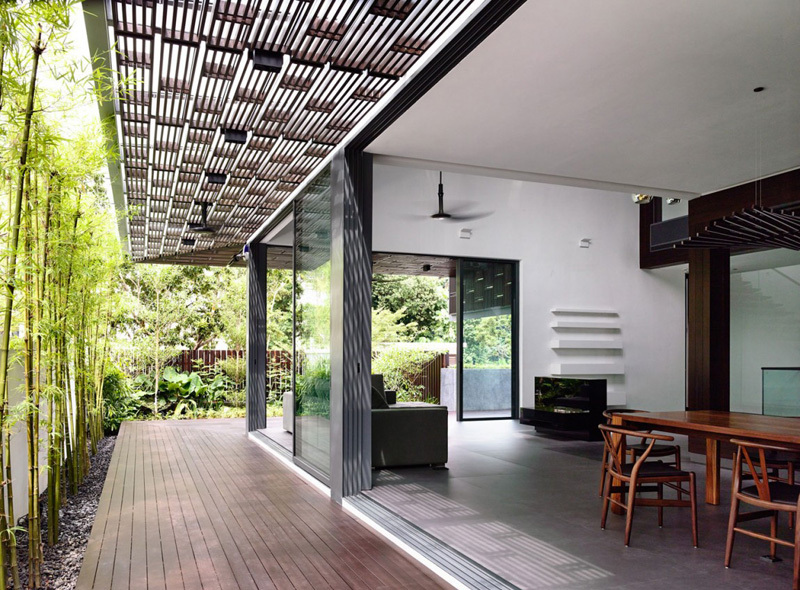 A beautiful modern home with a design close to nature. One of the best features of our dream house is a stunning and wide landscape. A house with a lush landscaping program and an interior that makes extensive use of rich wooden surfaces is usually one of the best characteristics of our dream house, right? Indeed Singapore is one of the countries in Asia where the extensive accessibility to nature is available. Designers made sure that nature has a great contribution in making the house beautiful and comfortable. 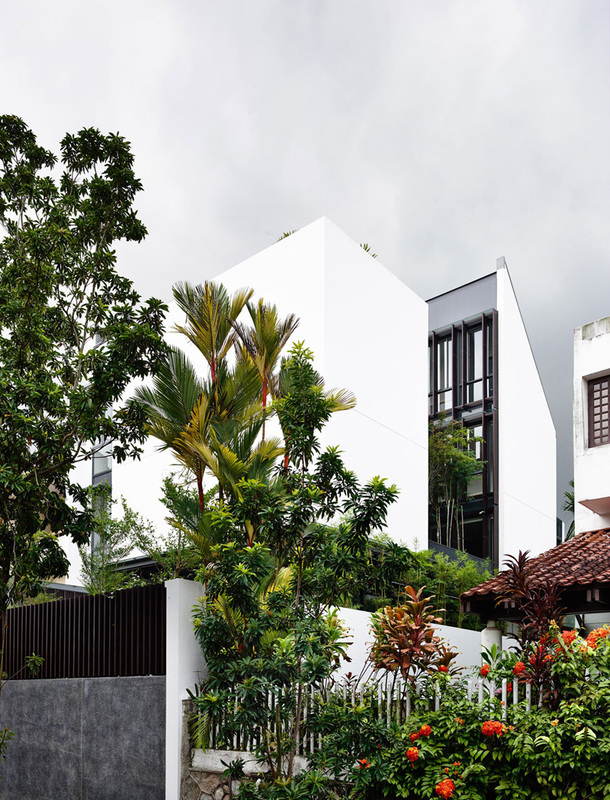 Today, we will explore the features of the private residence spotted in Singapore that connects to nature. This house is named as the Vertical Court. This is actually a courtyard on two levels situated in the centre of this semi-detached house. Unique feature: This courtyard house uniquely shows an extraordinary feature on its first level. 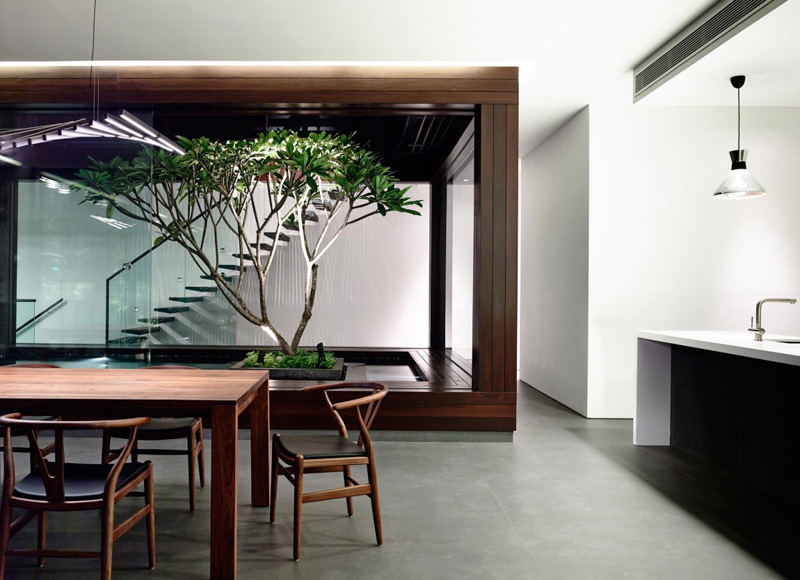 A frangipani tree is found at the center of a pond which is framed by a timber clad box. Geometric forms of the house building are highly observed from the exterior. 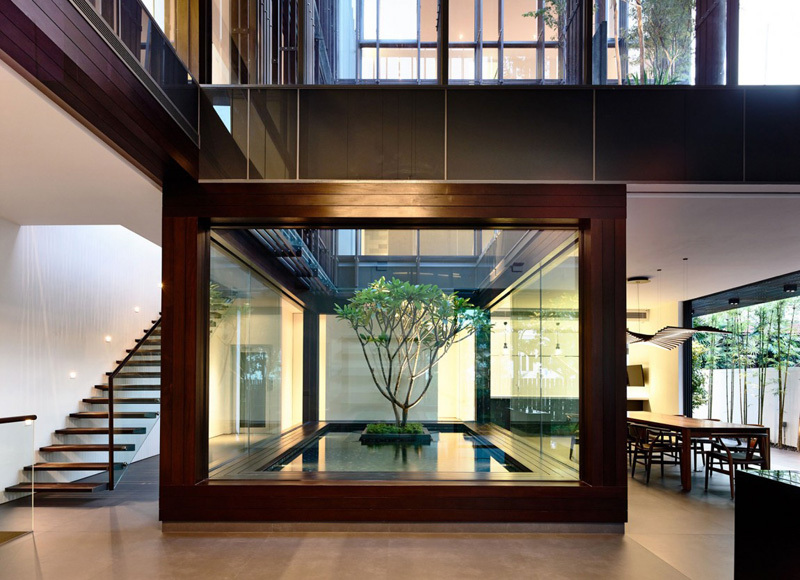 The tall trees and plants can instill the comfort and sustainable elements in the house design. White and dark brown palette complements with each other as they emphasized the modern architecture design. Smooth and rough texture is also displayed in the building. Glassed walls are very effective in allowing the sustainable lights to access the different levels and areas in the interiors. 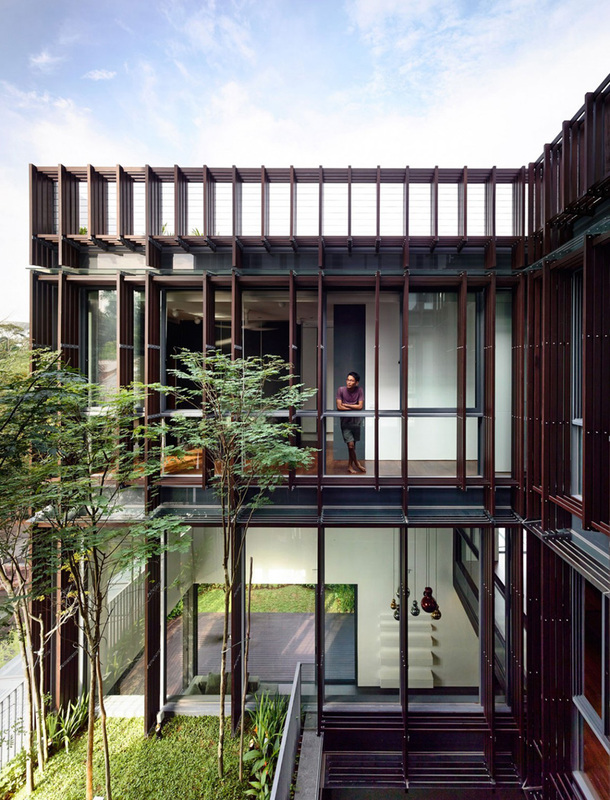 The dark brown structure and layout of the entire house is also visible to the exterior. Lines and patterns are employed in the walls and floors of the house. Comfort and cozy experience also exist in the open living space to the garden. Trendy furniture that maintains the brown shades and white are utilized in the interiors. Geometric shapes are also presented in the furniture and appliances found in the spacious living and kitchen space. 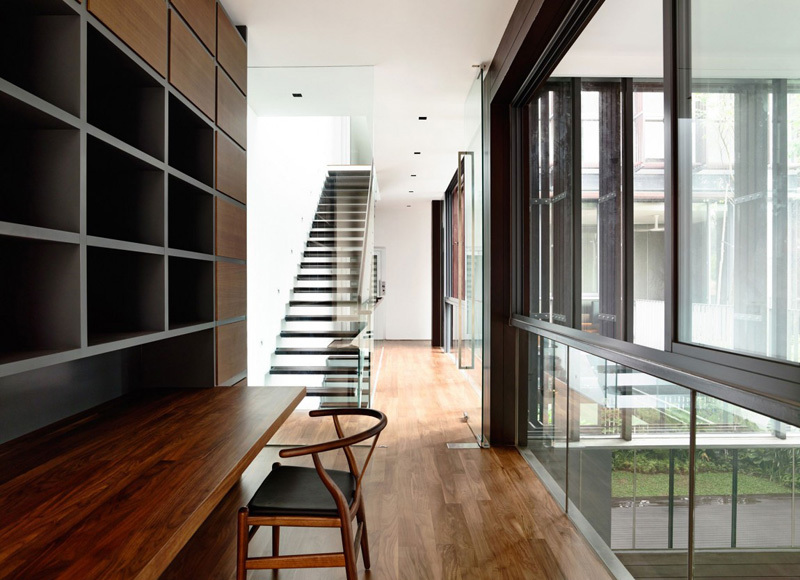 Glass materials made this house more modern and charming. The homeowner’s love for nature is also achieved from the design of the garden and exterior. Open layout is secured in all the levels of the house. A huge entertainment space is also allocated in the second level of the house where quality and relaxing time is available. Large screen is enough for the family to enjoy the comfort and luxury that these entertainment space offers. From the kitchen and dining space, the homeowner can take the full advantage of the pond set and framed at the heart of the house building. Lighting system shows its importance in making this house stand out among the other houses in the place. Modern fixtures and furniture stressed the trendy design of the interiors. Take a look at the captivating Fragipani Tree set in the center of this pond framed with glass. This not just prove the concept of modern and luxury but the designer also highlighted the client’s love for nature. 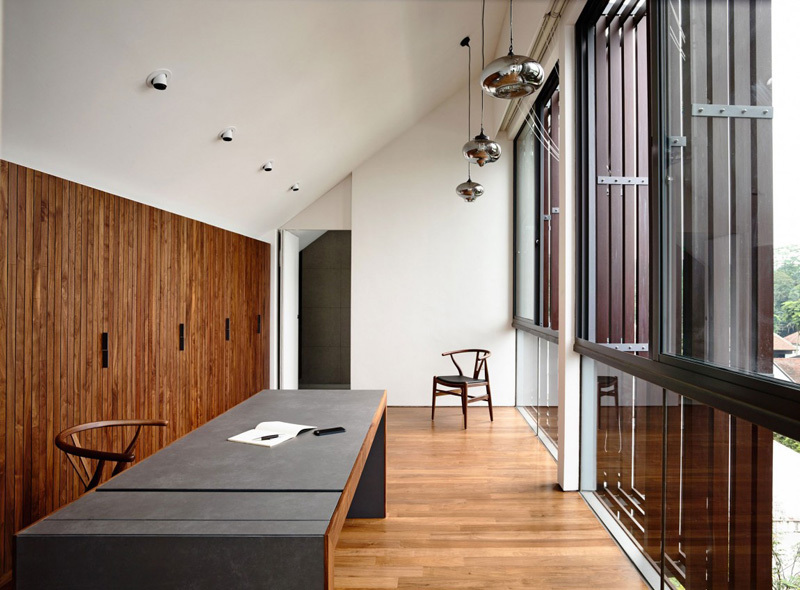 Take a look at the free space in the second level of the house which made into a study space for the client. The designer made use of the available spaces to maximize its functions and style. Spacious bedroom can still access the beauty of the nature for it has an open plan layout and glass materials are used here. Earth colors are applied in the walls, floors and even in the bed sheets and pillows in the bed. Sustainable light may allow the client to reduce the energy consumption for solar energy is much available here during daytime. Exquisite fixtures and cabinets are used here, too. 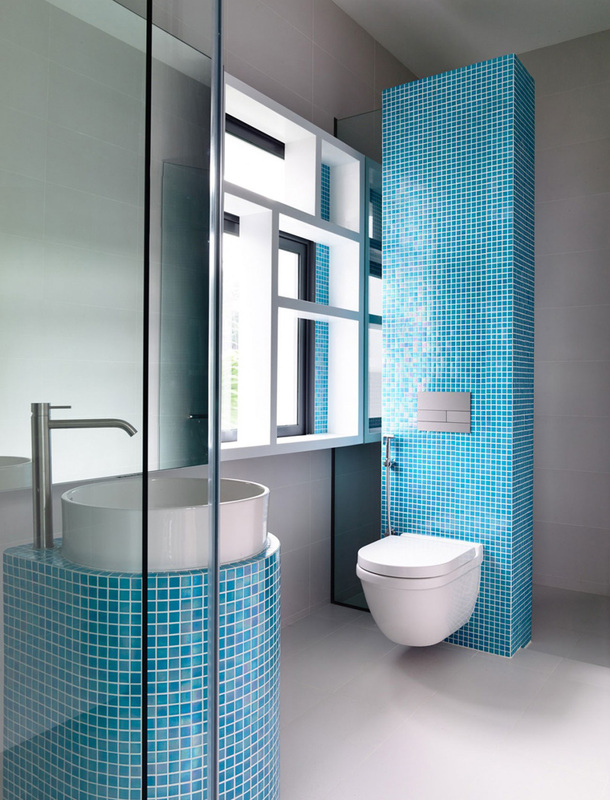 Shades of blue in the toilet breaks the plain grey and white palette used in the entire space. Trendy faucet complements with the round sink here. Vertical lines and patterns are highly observed even in the office room where space is maximized. Stylish lamps are also highlighted in the area that will make this more fashionable and elegant. 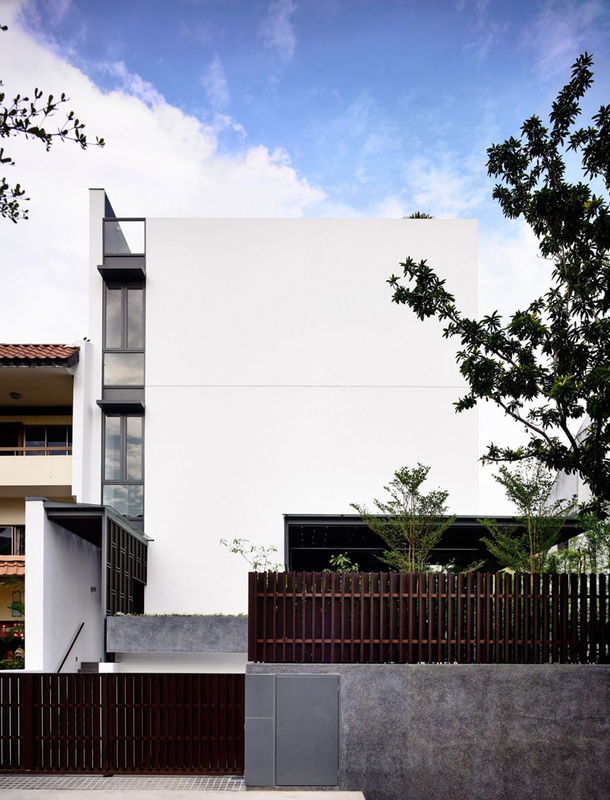 As you can see the extraordinary features of the house showcased on its first level and the HYLA Architects made this more captivating with the lighting system implemented in the interiors and exteriors, too. The second storey level of the courtyard lies over the dining area and in front of the master bedroom. 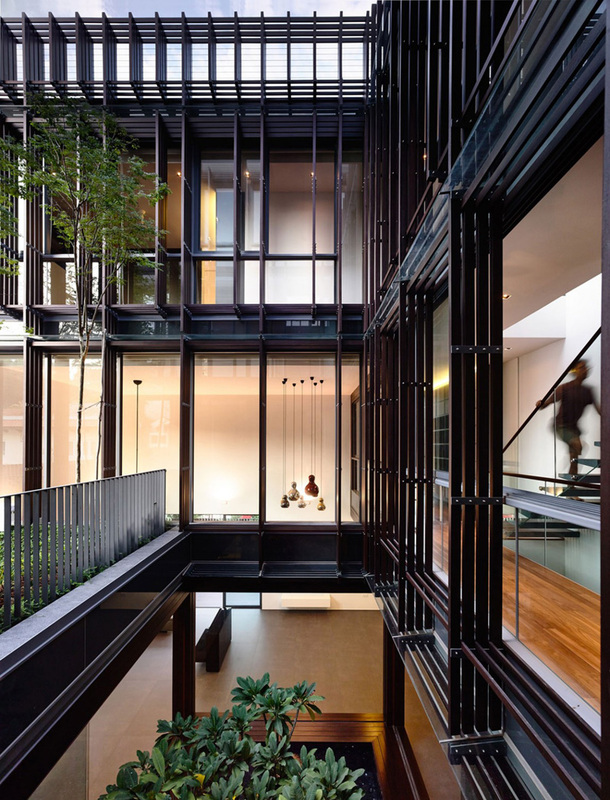 I am very fascinated by the full height glass façade facing the courtyard which is screened by interlocking vertical and horizontal timber members. 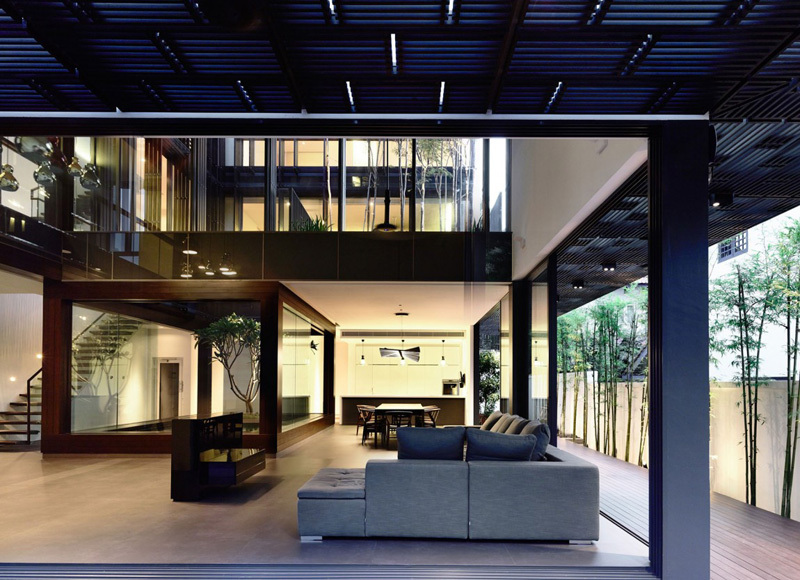 Hence, this courtyard offers the house a lot of privacy as well as allowing the sustainable light to enter the center of the house. It also acts as a buffer against noise from a major road a distance away. We hope that you also pick your favorite features of this house that may possibly be applicable in your own house or dream house in the future, right?